Modernizing its surface fleet for future naval operations, the US Navy is decommissioning aging ships that have ended decades of useful service life. One such vessels is USS Nassau. The vessel, decommissioned March 31st, 2011, has excellent existing design features, including aircraft hangars, a vast well deck, organic hospital capability (which the COH plans to expand) and acres of interior space in the ship’s hold which can be quickly converted for humanitarian supplies, heavy equipment and storage. Currently in the Atlantic Reserve Fleet “graveyard” in Beaumont, Texas, the Nassau is likely to be sold for scrap metal or sunk in a naval ordnance training exercise unless otherwise provided for. The next step in the process to creating this response capability is obtaining the final support of the U.S. government. Timothy Keegan and The Coalition of Hope (COH) have proposed a bold plan to utilize a retrofitted, former U.S. naval vessel to provide state-of the-art hospital facilities staffed by multinational medical personnel within the context of an international, public-private partnership. The Coalition of Hope projects that once operational the ship will positively impact upwards of 18,000,000 lives around the world during the renewed 20+ year life-expectancy of the ship. Keegan’s plan is to have the U.S. Navy and other friendly-foreign nation’s partner with the COH to reconfigure the former USS Nassau, as a multi-purpose humanitarian / disaster-relief vessel (HADRV). “In recent years, there have been dramatic changes in the challenges and demands of the overseas environment for humanitarian relief, development, and security, stabilization, and transition and reconstruction (SSTR) personnel,” observe Denver University Professor Van Arsdale and U.S. diplomat and Marine Corps Veteran Derrin Smith. The COH concept provides a unique, innovative, and timely capability to help a whole host of NGO, IGO, academic institutions, and government agencies who might not otherwise have access to participate in humanitarian relief operations. COH is currently in talks with the U.S. Navy to acquire the vessel. Donating the USS Nassau will be a cost-effective way for the U.S. government to contribute to humanitarian assistance and disaster-relief efforts while showcasing its capabilities and strengthening international relationships. The retrofitting of the USS Nassau will also create American jobs in the struggling shipyard industry during a period of high unemployment. 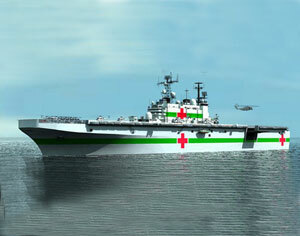 In conjunction with a broad coalition of nations, non-profit and non-governmental organizations, and other key global partnerships, COH plans to retrofit the vessel to support state-of-the-art hospital facilities and medical staff, as well as transport first-responders and supplies on a large-scale. The retrofitted USS Nassau’s unique command and control, heavy airlift and amphibious landing craft capabilities will make it faster and more efficient than any humanitarian assistance and disaster-relief vessel in the world. The Coalition of Hope Foundation (COH) is a non-profit public charity based in California, with offices in Miami, Florida. Established in 2005 as a humanitarian assistance and disaster-relief organization the Foundation provides support on an international basis, including domestic relief efforts in support of hurricane Sandy victims, large-scale efforts in the Gulf Coast after Hurricane Katrina and in Haiti after the devastating earthquake of 2010. COH plans to retrofit the vessel to support state-of-the-art hospital facilities and medical staff, as well as transport first-responders and supplies on a large-scale. The retrofitted USS Nassau’s unique command and control, heavy airlift and amphibious landing craft capabilities will make it faster and more efficient than any humanitarian assistance and disaster-relief vessel in the world.